As the temperatures increase over the next few months, so does the amount of outdoor construction work. Knowing how to work safely in summer weather, with heat indexes reaching well over 100 degrees in some areas of the country, can help reduce the chances of heat related injuries. In some cases, the combination of heat, humidity, and physical labor can even lead to fatalities. The two most serious forms of heat related illnesses are heat stroke and heat exhaustion. The ability by those in your organization to quickly recognize the warning signs of these illnesses and take the correct immediate actions could mean the difference between life and death. Avoid Dehydrating Beverages: This includes alcohol, coffee, tea, and caffeinated soft drinks. Wear Proper Clothing: Go with lightweight, light-colored, and loose-fitting to protect against the heat. be sure to change your clothing if it gets completely saturated. Don’t Over Do It: Keep an even pace and try not to unnecessarily overexert yourself. Know your limits. Take Breaks: Schedule or take rest periods throughout the day. Find some shade or an air-conditioned area to drink some water. Use a Damp Rag: A cool, damp rag is always helpful to keep around your neck or use to wipe down sweat. 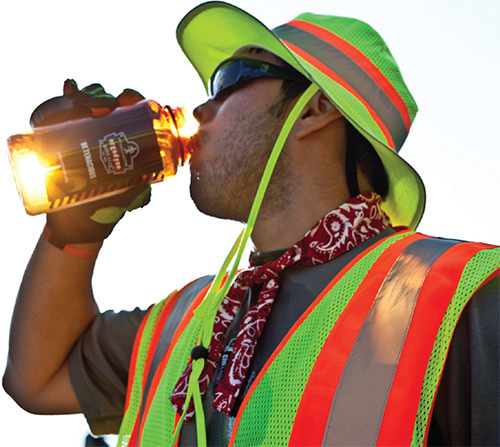 Know the Signs: Be alert to the signs of heat related illnesses…whether its for your or another worker. Sunglasses: make sure to wear UV-absorbent sunglasses to help protect your eyes and make sure you can see what you are doing. Food: Eat smaller meals. Fruits high in fiber and natural juice is great. Avoid high protein foods. Click here for a more thorough overview of hot weather work via OSHA’s website. Click here to contact Allied’s Risk Engineering Division for more information on hot weather safety and training materials.